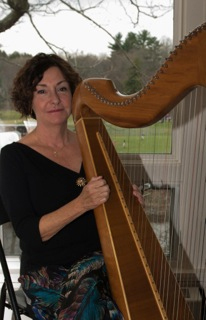 We’re thrilled to welcome Paula Moore, harp musician, to the Sawmill River Arts Gallery this Saturday, May 7, in celebration of the gallery’s 5th anniversary. Paula will perform inside the gallery during the celebration, Indoors and outdoors, watch artists demonstrating their work and enjoy refreshments while you wander amongst walls and shelves of locally made and inspired, handmade art and fine craft. Hope to see you Saturday – 12-6!